My Experience With Cooking: Hummus and an Award!!! You are here: Home > Middle-Eastern > Hummus and an Award!!! Hummus is a middle-eastern dip with chickpeas, olive oil, tahini(sesame seed paste) and few other ingredients. A few weeks after my arrival in US I was dining out for the first time here with one of our friends and family when they ordered Hummus as an appetizer. It was served with Pita bread. Not knowing what Hummus was at that moment they challenged me to figure out the ingredients. I tasted a bit and thought the taste was familiar...I could figure out garlic, lime but what was the thick paste made of...kept thinking..thinking... somewhere at the back of my mind I knew...but what? Suddenly it clicked,"Hey isn't this chickpeas?" Voila! That was how I was introduced to Hummus and I have loved it ever since. No cooking time is required to make this dip and all you need is a food processor and a can of cooked chickpeas. Hummus is easy to prepare with canned chickpeas because they blend more easily rather than making with freshly cooked drained chickpeas. Lemon juice, garlic and tahini gives added flavour. Tahini can be obtained at grocery stores. To make tahini, sesame seeds are blanched in hot water to remove the outer skin that floats to the top. These are removed and the seeds are ground along with salt and olive oil. It may be served as an appetizer, dip or used as sandwich spread...its left to your imagination! On days when I feel lazy to cook or don't have enough time I even make it as a dinner entree along with Pita bread. Chickpeas is a good source of proteins and fiber. Sesame seeds too are a good source of protein, vitamin E and is a powerful antioxidant. So when you mix all these together..wow!..you get a whole bunch of nutrients in one simple dish! Add chickpeas, tahini, yoghurt, salt, garlic, lemon juice to a blender/food processor and blend well until it turns into a smooth paste. Add olive oil and blend well to mix. 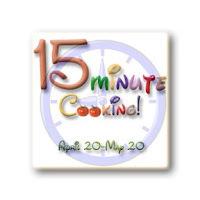 15 minutes cooking event hosted by Mahimaa. AFAM Olives hosted by Priya of Easy n Tasty Recipes and started by Maheswari. Thanks Aruna :) That was quick!! Oooh1 the hummus looks so creamy.It's a very healthy dip.Nice pic Pooja. Wow nice recipe Its very simple and easy.My husband love this hummus This week only i will try this recipe. Thanks Vineela :) You would love it! Looks creamy and nice pooja..Simple recipe.. Thanks Ramya..I do love to dip tortillas! Wonderful Presentation...The bowl is soo cute..
that's a delicious hummus Pooja! Never tried it at home. looks yum. Thanks a lot for the link Vibaas :) I have a doubt as in this recipe olive oil is not a main ingredient..Is this okay? Thats a great one..i havnt tasted hummus yet.. I like this dip...Is Thahini home made? Looks nice and yummy. Lovely presentation. Thanks Ms.Sailaja. Tahini was store bought. Hummus looks great Pooja...makes a great dip. lovely dip pooja. very nice pic and presentation. got ur email.thx for sending.